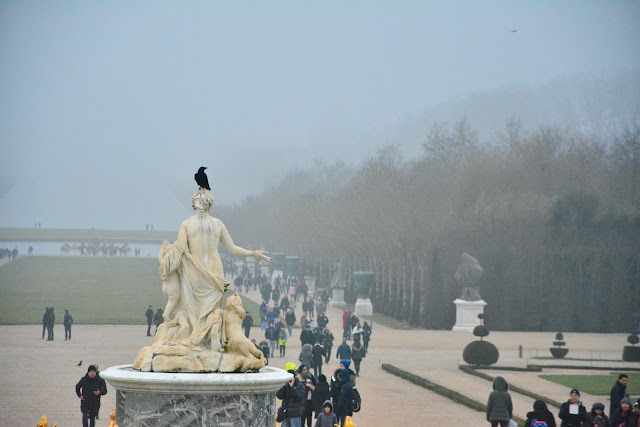 The Paris Feast: Versailles shrouded in mist : A visit to the Royal gardens in winter. 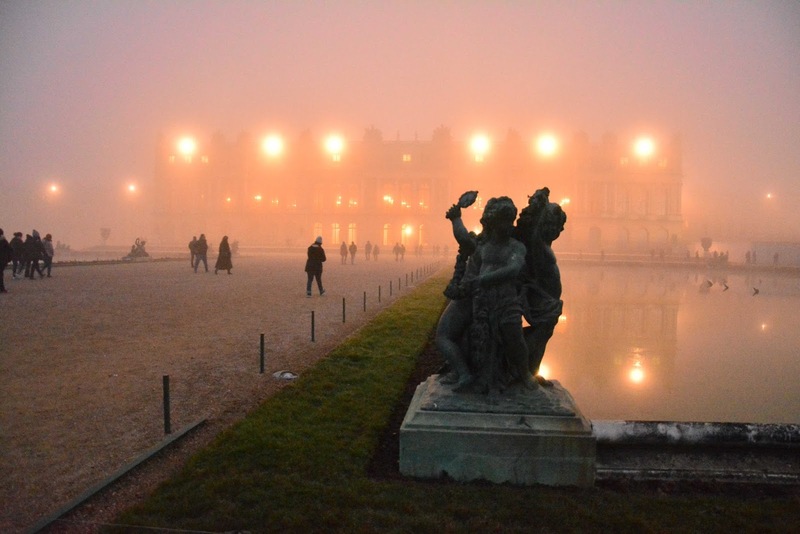 Versailles shrouded in mist : A visit to the Royal gardens in winter. A hunting lodge built by King Louis XIII in 1623 was transformed into a royal palace by Louis XIV in the 1660s, now stands as a majestic monument, as a reminder of the royal grandeur of the Old Regime, a symbol of Imperial France and an ode to the revolutionary epoch, the deterioration and revival in the post World War 2 era to revive the glory of the vast expanses of the Royal Castle and gardens that lay roughly 30 kms from the center of Paris. 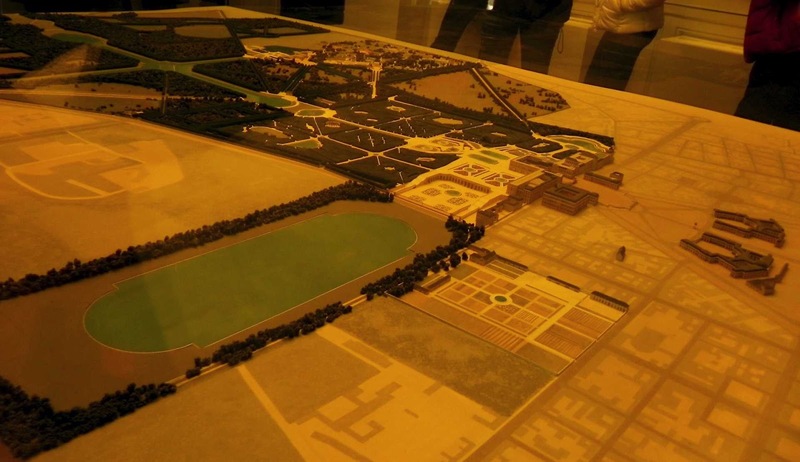 Some say that the restoration launched under the fifth republic, starting from the 1950s may well be more expensive than the expenditures bore by the monarchy under the Old Regime. 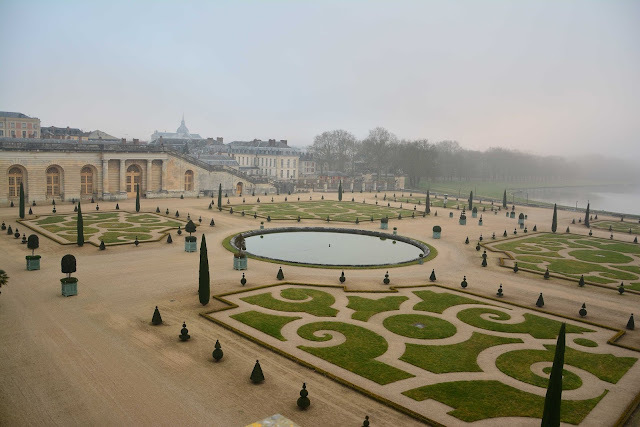 Such restorations has now resulted in the Versailles Chateau being one of the most visited monuments of France with an average 5 million visitors to the palace and 8-10 million that walk the gardens per year. Surely, summer is the best time to visit the gardens when the lush green trees contrasted against the white marble statues and clear blue waters of the Grand Canal offer a spectacular sight for the visitors. 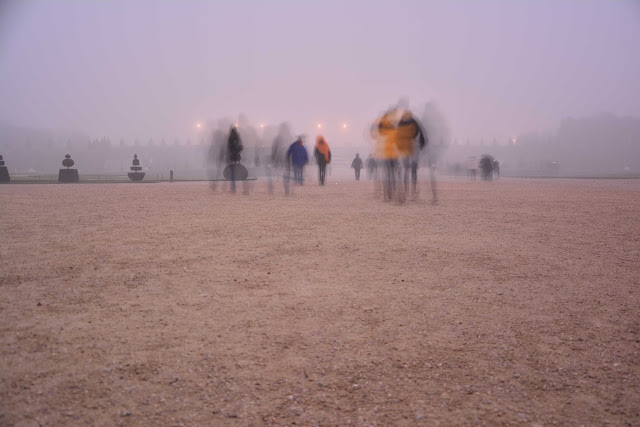 I have been to the gardens in all the seasons, but I personally prefer the visits in winters when, albeit the marble statues all being covered to protect them from the frost and occasional snow, the mist and low visibility can render the gardens into a mystic environment that can push ones imaginations beyond the richness, grandeur and power struggles to a soothing contemplation of the past and present that the gardens and the palace personifies. 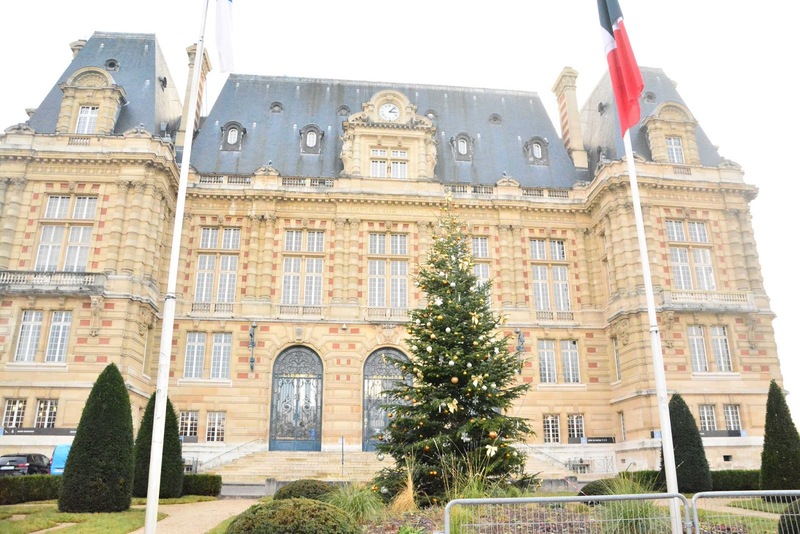 To start with the city of Versailles adorns itself with the festival lights and you may find the giant fir decked with lights and decorations in front of the Town Hall (Hotel de Ville) and also a nice ice skating rink there. Often on foggy winter morning the sky is overcast and this offers a diffused light which may be perfect if you are interested in photography, the golden roof of the caste can offer a perfect contrasting object against the fog which seems like low floating clouds. 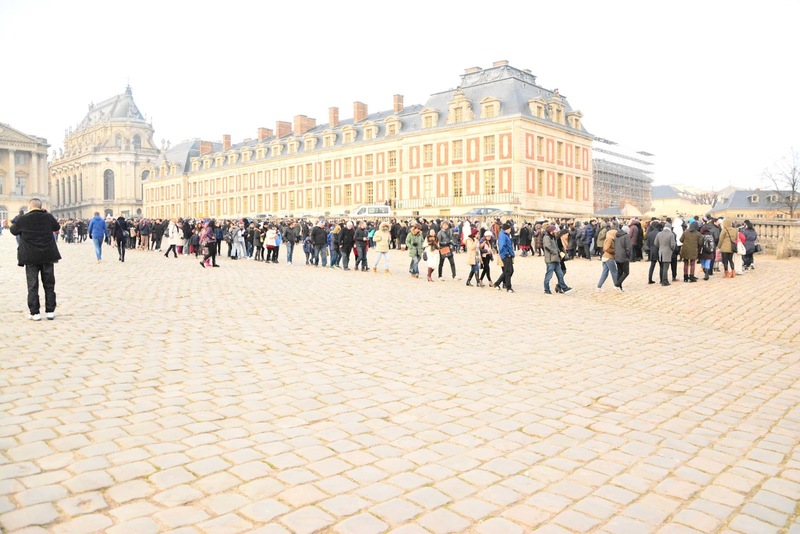 The advent of the New Year and the holidays can however mean long queues for the entrance to the castle. 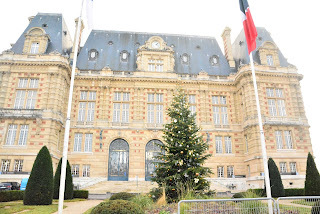 I went there on 30th December and there was already a long spiraling queue which requires visitors to wait for at least a couple of hours to have access to the castle and the museum. I would say is quite worth if you are interested in admiring the grandeur of the Hall of Mirrors where the Treaty of Versailles that marked the end of World War I was signed. The principal feature of this hall is the seventeen mirror-clad arches that reflect the seventeen arcaded windows that overlook the gardens, which would be rather mystic in appearance given the thick dense mist and low visibility of such a winter morning. The access to the gardens is free of cost and does not have any queue and can be entered at will. 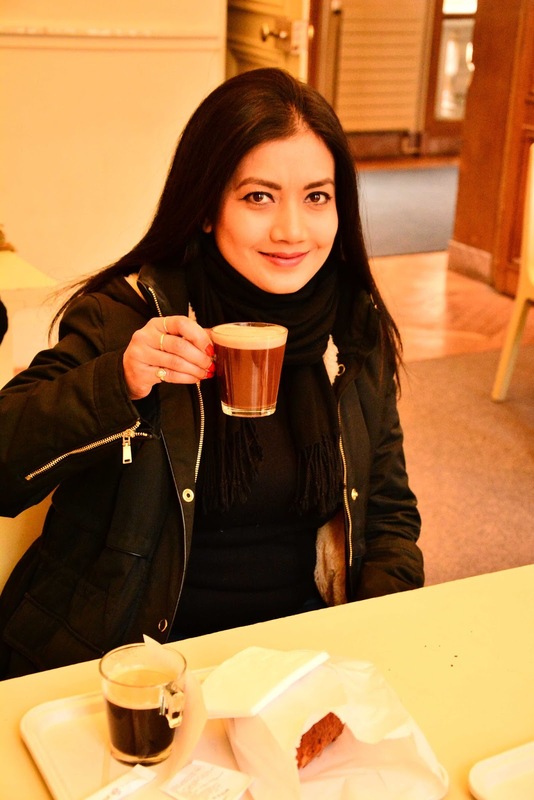 However first to warm oneself and store some energy before moving into subzero temperatures, one can take a rapid pit stop at the café just at the entrance to the gardens. I tried some hot chocolate and I must say it is not one of the most flattering ones I tasted in my life, it simply lacked milk and was only some chocolate powder in hot water. 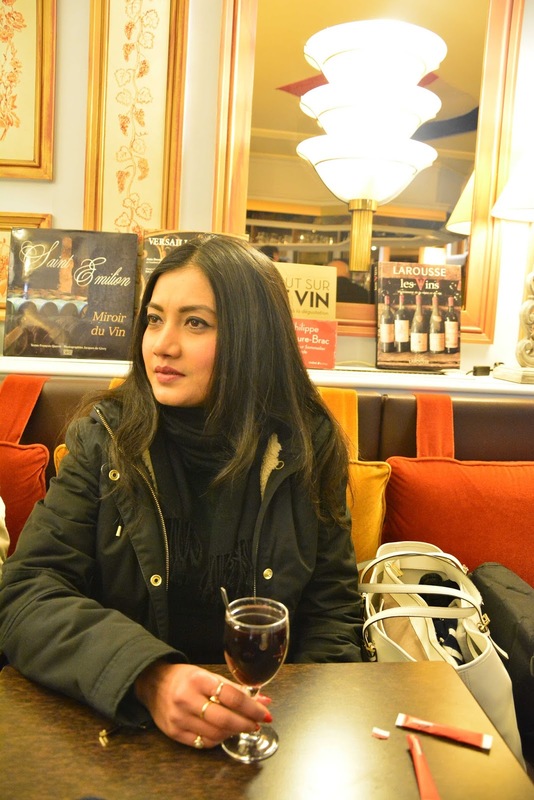 But the café was warm and that is what mattered before I moved into the freezing and frozen 800 hectares of the Royal gardens of Versailles. The gardens start with the orangery on the left built in 1684, patterned with sweet orange trees lining up in beautiful motifs that stretch around a circular fountain. 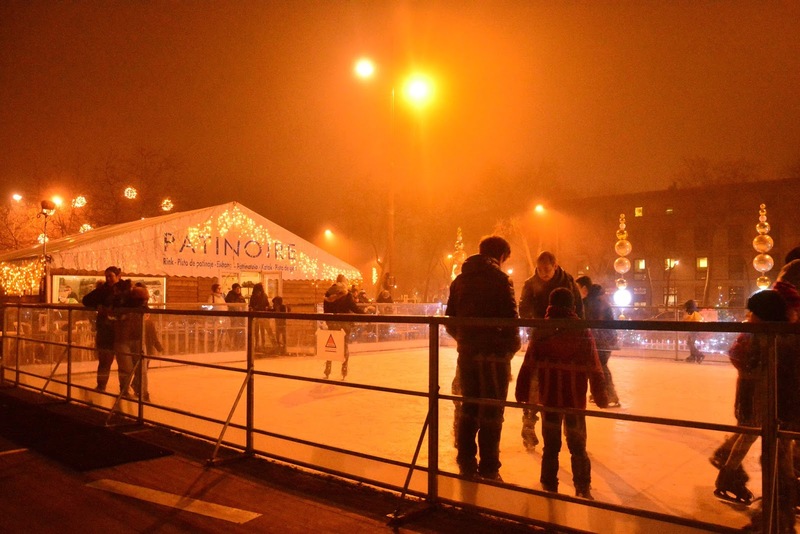 The fountain may be not in operation in winter yet the beauty of the orangery remains intact. 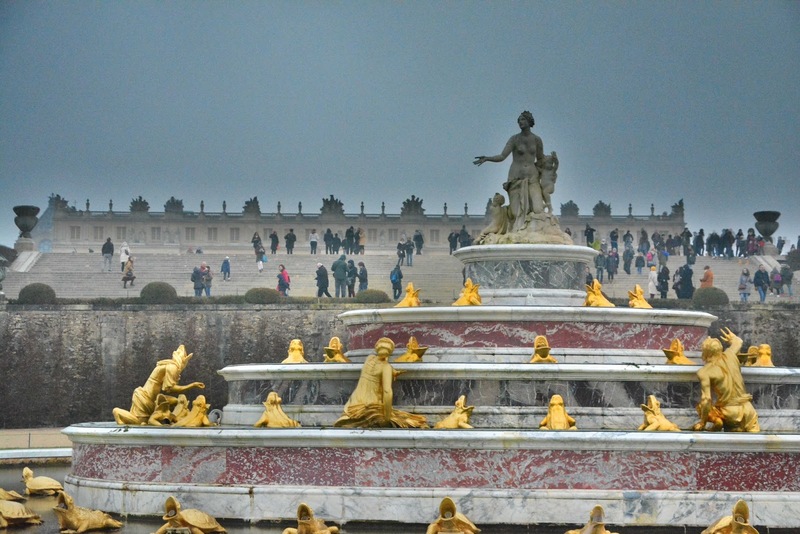 The most identifiable fountain of the Versailles gardens comes next, the Fountain of Latona. According to Greek-Roman mythology, Latona was the mother of Apollo and Diana which she bore from Jupiter (Zeus). 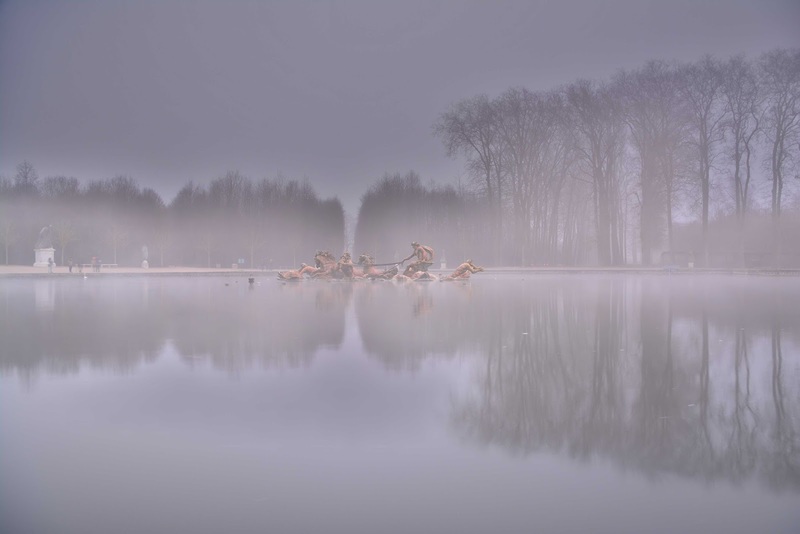 Due to the “illicit” nature of bearing the children, the goddess and protector of marriage, Juno forbade all lands to allow Latona to give birth. 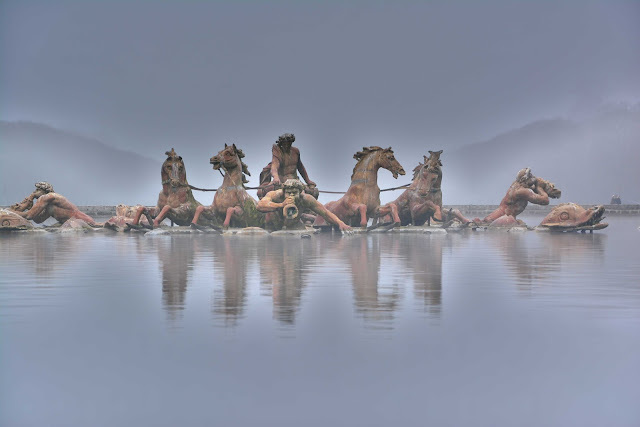 Finally the children and future gods Apollo and Diana were born on a floating island under the care of Neptune (Poseidon). 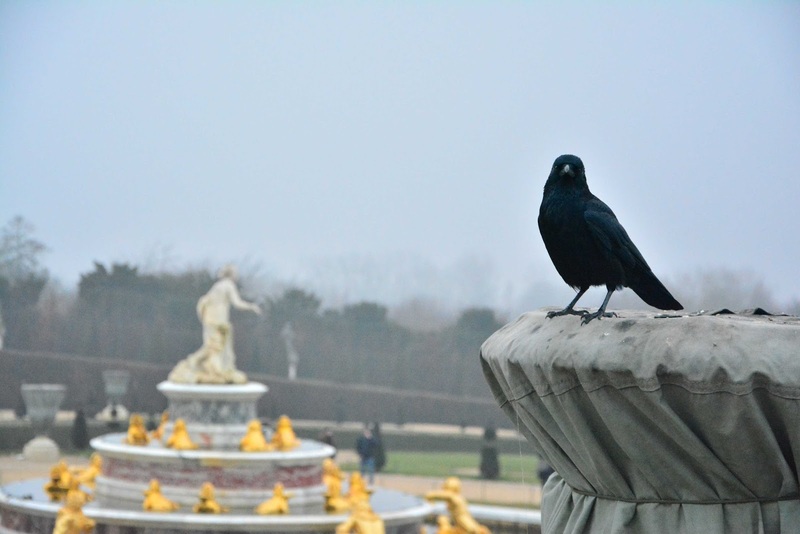 The statue of Latona and her two children was placed in the Garden of Versailles by André Le Nôtre under Louis XIV around the 1660s. Initially the statue of Latona, defying the bonds of marriage with her children was placed in the center with an interior ring of farmers offering her water, and an outer ring of frogs, turtles and other creatures which according to the legend were those farmers who refused to offer water to Latona during child birth. Later in the 1680s the fountain was raised in a conical form to shape like a wedding cake, and this is the pattern that exists still date. The original statue of Latona and her children was however replaced in 1980 by a replica by Michel Lorenzi following a vandalization of the original sculpture. 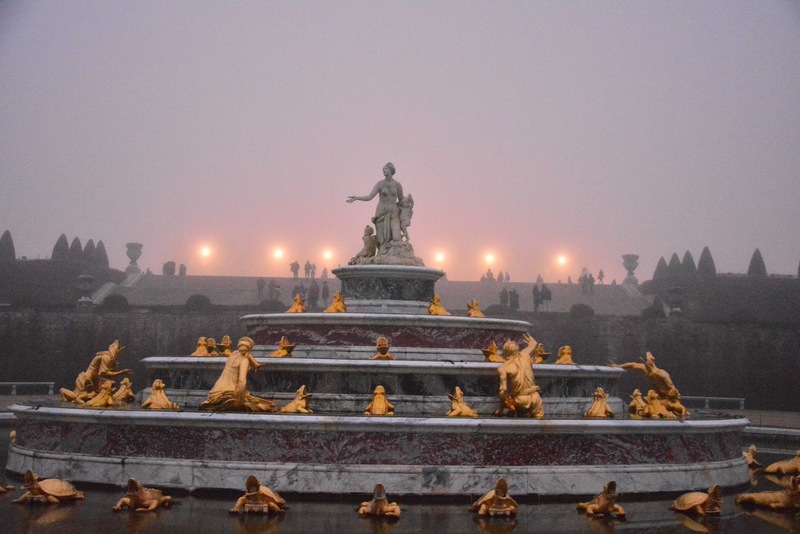 A through 2 years renovation work carried out between 2013 and 2015 also rendered the fountain to it magnificent form that can be found today at the crowning point of the gardens of Versailles. Even without water flowing from the jets the statue overlooking the Apollo fountain covered in mist and the Grand Canal is awe-inspiring. 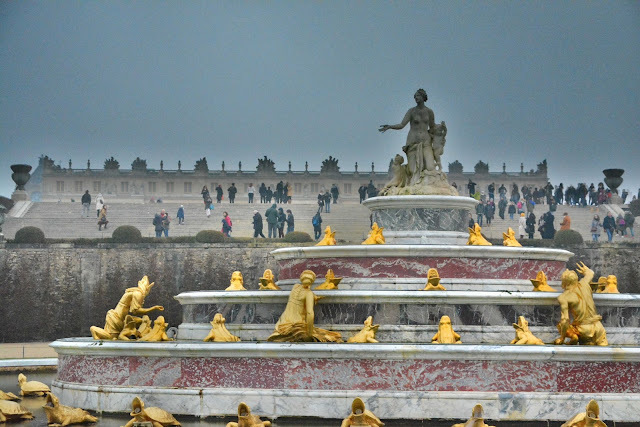 A walk down the straight narrow alleys on each side of the fountain can help you discover some of the hidden statues each depicting a story decked in mythology. 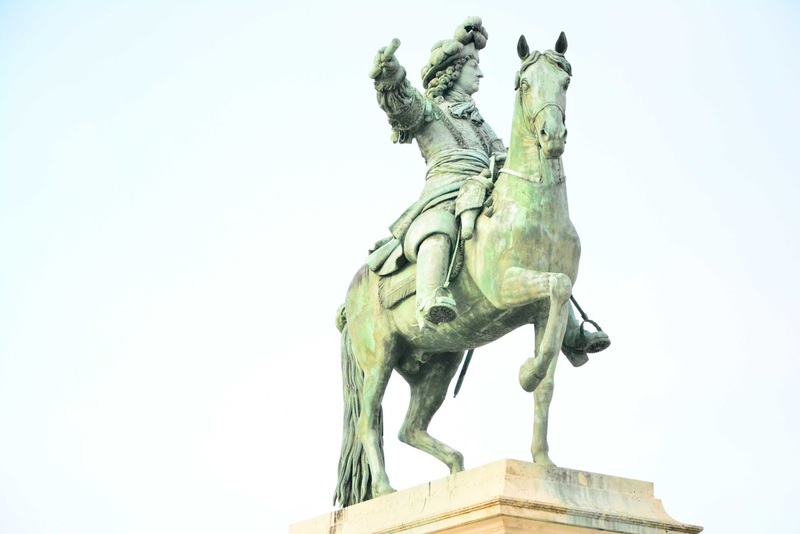 These statues are however mostly covered in winter. 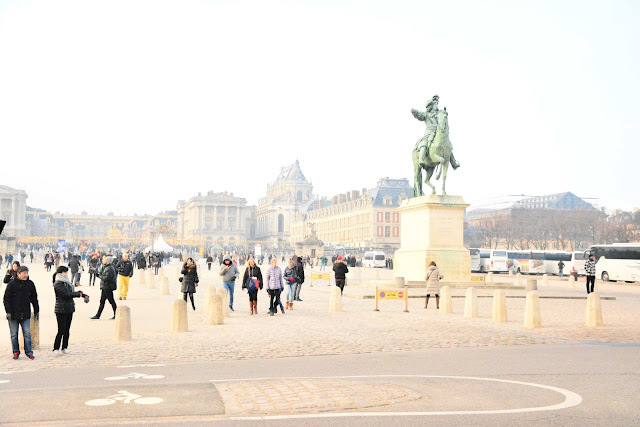 The straight wide path from Latona fountain leads to the fountain of Apollo where the sun god can be seen on his chariot. This particular fountain with the backdrop of the Grand Canal shrouded in mist was the most spectacular sight on this visit to the gardens. 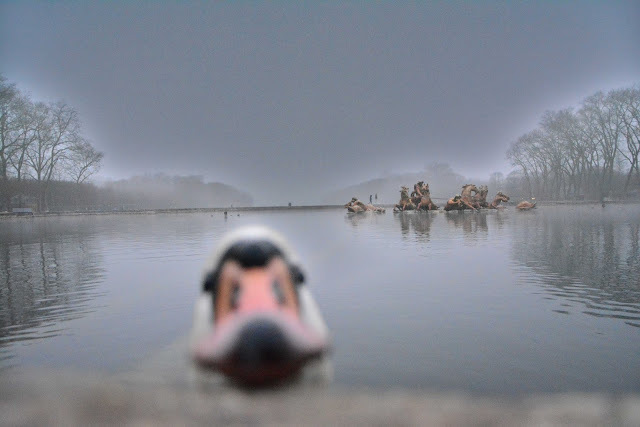 And you can often meet some curious creatures peeping up for food, in this case a curious swan that missed out on flying south (not sure if they even do so). 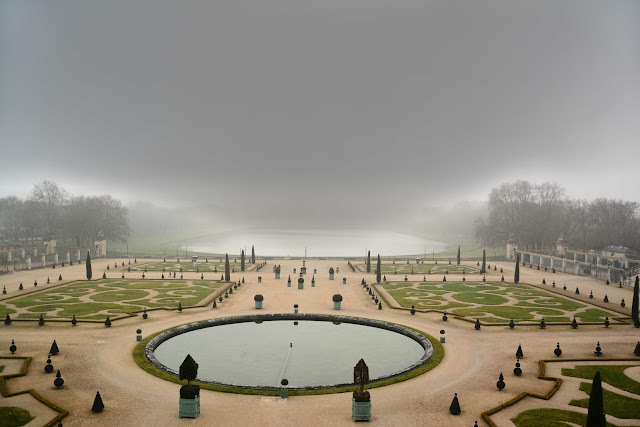 As I already mentioned, the Versailles gardens in the winter mist is ideal for photographers and even simple clicks by a mobile camera can bring out a poetic ethereal feelings from the royal pictures. 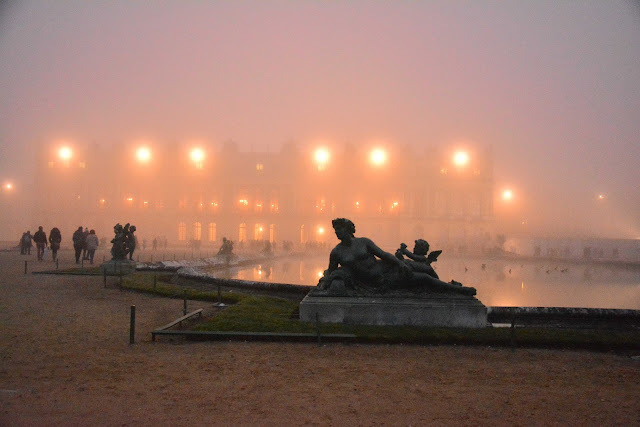 On the way back in fading dusk (though it was only 5 P.M. , the gardens close at 6 P.M. during winter) the lights from the castle peered through the constantly thickening mist and that in itself had a supernatural effect added to the sub-zero (-4°C to be precise) temperatures around. Just before leaving the gardens and entering the Castle premises, above the Latona fountain and just below the Hall of Mirrors of the castle, one can find the Parterre of Water surrounded by statues each representing one of four collections: the four elements (Earth, Water, Air, Fire), the four parts of the world (Europe, Asia, America and Africa), the four seasons, the four rivers of France (Loire, Seine, Rhone and Garonne) etc. 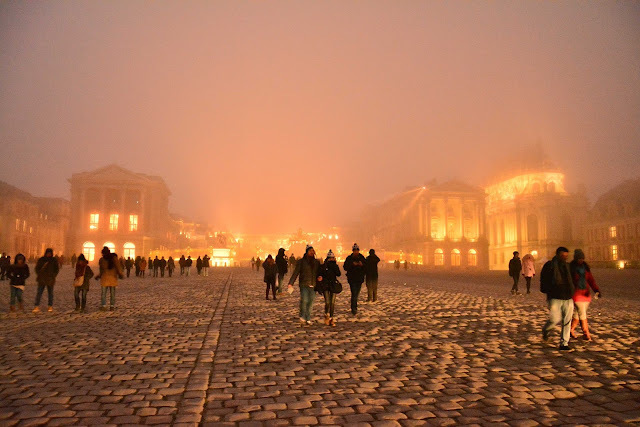 Simply a visit to Versailles even in winter with descending mist and falling temperatures is something to savor and guard in pictures and memory. There are many unique cafés as well scattered in the city around the castle and a mulled wine or grog to wrap up the visit is always welcoming. Here’s a toast to the grandeur and richness of the Old Regime which has been well maintained and restored under the Fifth Republic. 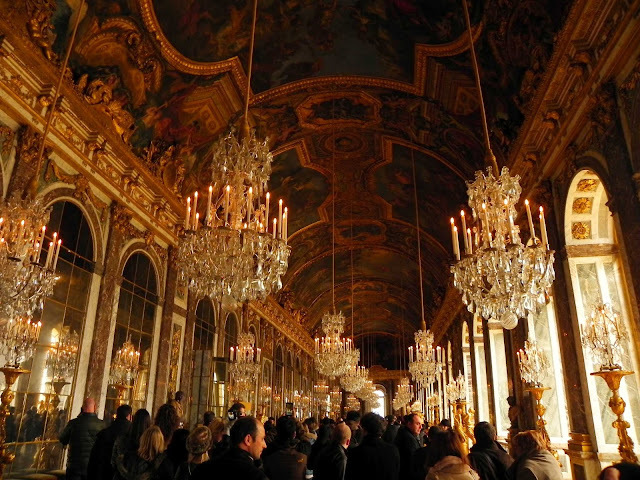 The palace looks beautiful, and your photographs are just breathtaking!